Amazon has announced the availability of their new Kindle Fire device which is positioned to compete with Apple’s iPad (and Barnes & Noble’s full color Nook device!) I am very excited about this device as I have been struggling over which e-reader to possibly purchase. I am a very loyal Amazon customer but have been strongly considering the B&N full color Nook device because…well, it’s in color. And you can use it to browse the web, watch YouTube videos, check email, etc. However, I found it to be a bit cost prohibitive. The iPad was also VERY tempting, but even MORE cost prohibitive, and I am not at all crazy about using iTunes. So, I really had my eye on the Nook. 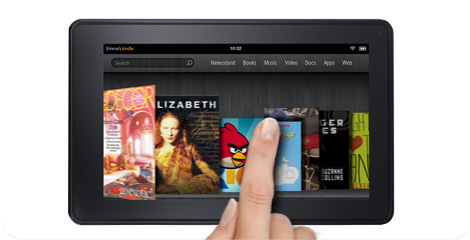 Now, Amazon has announced the creation of the Kindle Fire. It can do everything the other devices can and then some, as it includes free storage on Amazon’s Cloud – a place I like to think of as heavenly. The new Kindle Fire even has a really cool name. And, the best part is the price – just $199.00! Compare that to the iPad at around $599.00 or the Nook at $250.00! Check out the Kindle Fire, Full Color 7″ Multi-touch Display, Wi-Fi today on Amazon.Com and let me know what you think!